Punch cards? Totally passÃ©. Handcrafted USB sticks that cost $1000? That's the way of the future! At over $15 a gigabyte, the Pocket Memory 5 does not exactly represent great value for money, but when you take a look at the custom made 64Gb memory stick, it's hard not to feel a little tempted by it. 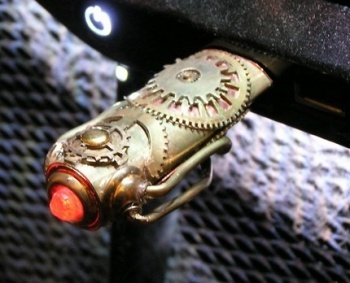 The drive was created by Will Rockwell, a steampunk artist, and is built out of brass and copper, with a glowing jewel at the end. In Rockwell's own words "This enormous drive is the culmination of months of research into the design and potential of Steampunk USB drives ... The drive comes in its own custom velvet lined box and features a unique "cooling system" of pipes and manifolds to ventilate the enormous memory. " I'm not going to pretend that it's a steal at only a grand, but it sure is pretty.